It’s the gift that keeps on giving, perfect for the person who has everything, and you can choose your own price! Of course you and your gift recipient can read every week without being part of the community, but without our members On Pasture can’t survive. On Pasture is not supported by any grants or government funding. We count on doing such a good job that our readers, advertisers and underwriters will see On Pasture as a great investment in meeting their own goals. Choose when you want your recipient to open the gift. “Do Not Open Until Christmas” is the default because that’s a popular saying. But you can also choose other holidays, or “Open right now before it spoils!” Write a short note to your giftee and add their name and address. 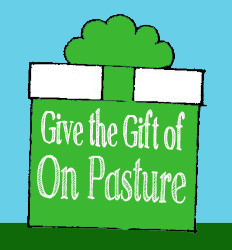 Then click on the Give the Gift of On Pasture button. The next page you see will let you fill in how much you’re giving. We’ll mail an On Pasture bumper sticker and a copy of your note to the person getting the gift and print the opening instructions on the outside of the envelope. And to thank you for being so thoughtful, we’ll send you a bumper sticker too. Last but not least, we’ll be sure you’re both added to the list of folks who get the weekly announcement that new articles are up. That way you’ll never have to worry about missing the next issue of On Pasture. Do Not Open Until ChristmasDo Not Open Until HannakuhDo Not Open Until Your birthdayOpen right now before it spoils!